This course provides an introduction to data preparation, data discovery, and report creation in SAS Visual Analytics. The e-learning includes 15 hours of Virtual Lab time to practice. Classroom and Live Web students have access in class and can purchase lab time separately. Organize content in SAS Drive. View and interact with reports using the SAS Report Viewer. Access and investigate data in SAS Visual Analytics. 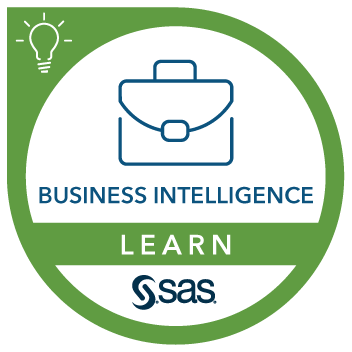 Prepare data using SAS Data Studio. Perform data discovery and analysis using SAS Visual Analytics. Create interactive reports using SAS Visual Analytics. Log on and off a computer and use a keyboard or mouse. Introduction to SAS Visual Analytics. Exploring the SAS Visual Analytics course environment. Viewing SAS Visual Analytics reports. Investigating data in SAS Visual Analytics. Cleaning data using SAS Data Studio. Exploring data with charts and graphs. Creating data items and applying filters. Performing data analysis (relationship charts).